Manage events in one seamless system. Each step is discussed in this document. 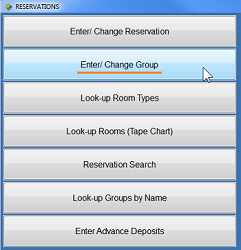 To set up the group go to Reservations Menu > Reservations Operations > Enter/Change Group. Enter the group code up to ten (10) characters. It does not matter whether you use letters, numbers, or characters such as "-" but make it easy to remember and be consistent in your group codes. This will make it easier down the road. If you are looking up an existing group, click the Look-up button. "Master folio:" will populate later with the folio number created by the system if you check "Create master folio automatically". If a master folio exists already for this group, enter the folio number or look it up by clicking the magnifying glass icon. "Apply master folio to reservations" should be checked if guest room and tax charges should post to the group's master folio. If guests pay their own room and tax charges, do not check this. If your event does not include lodging, do not check this. "Create master folio automatically" should be checked if you wish the system to create the master folio automatically. This will happen when you complete the group setup. "Group name:" may be up to thirty characters in any combination. Examples are EXECU/TECH, SMITH-JONES WEDDING, WILKINS REUNION. "Address 1:" The first address line may be up to thirty characters. "Address 2:" The second address line may be up to thirty characters. "City/state:" You can enter the US zip code for the city/state to populate or you can enter the city, up to twenty characters. Enter the 2-letter state or province code. "Country/zip-postal:" Enter the country and postal code. "Contact:" Enter the contact person's name, up to thirty characters. "Phone number:" Enter the phone number up to twelve characters. You may use any format you wish (5554443333, 555-444-3333, 555.444.3333 etc.) but be consistent with other groups and guest names. "Fax number:" Enter the fax number up to twelve characters. You may use any format you wish (5554443333, 555-444-3333, 555.444.3333 etc.) but be consistent with other groups and guest names. "Comment 1:" You may enter a comment up to thirty characters. You may update the comment to guest reservations by clicking "Update reservations" after you have finished setting up the group. "Comment 2:" You may enter a comment up to thirty characters. You may update the comment to guest reservations by clicking "Update reservations" after you have finished setting up the group. "Comment 3:" You may enter a comment up to thirty characters. You may update the comment to guest reservations by clicking "Update reservations" after you have finished setting up the group. "Email address:" Enter the contact's email address up to fifty characters. "Travel agency:" If applicable, enter a travel agency code or click the magnifying glass icon to look up. "Type payment:" Enter a valid payment code or click the magnifying glass icon to look up. Note that credit cards are not processed in the group setup. "Account #:" If the payment code is DB, enter the Direct Bill (City Ledger) customer code. "Expiration date:" This field is no longer in use. "Arrival date:" Enter the arrival date for the group. If lodging guests will not arrive at the same time, enter the EARLIEST arrival date. If you do not know the date you may click to calendar to look up and select the date. "Cut-off date:" Enter the cut-off date for blocked guest rooms for this group. On the cut-off date, guest rooms that have been blocked but have not been picked up by actual reservations will be dropped from the block and will return to inventory. If you do not know the date you may click the calendar to look up and select the date. To make the cut-off date the same as the arrival date, press Enter and the field will populate. To make the cut-off date one day before the arrival date, enter -1. "Market/Source:" Enter the group's market segment code in the first field. Enter the group's source of business code in the second field. You may click the magnifying glass to look up. "Group Type:" is an optional field not pre-defined elsewhere. Examples are WEDD, FAM, CORP, TOUR. You may use up to four characters. "Tax exempt:?" may be answered "Y" or "N" depending on whether lodging guests are exempt from room/lodging taxes. Next, click the "Block Rooms" button at the bottom of the screen if you wish to set aside lodging accommodations for the group's guests. If you do not wish to block guest rooms, click the "Setup event" button. To set aside guest lodging accommodations, click the "Block rooms" button on the Group setup screen. In the Room Type column enter the room type you wish to block and press Tab. In the Room Rate column enter the nightly room rate for this room type and press Tab twice, or press Tab twice to accept the default rate. To apply a guest package, enter P in the Room Rate column and press Tab once and then enter the package code in the Pkg Code column. To view available room types, place your cursor in the Type column and right-click. For each day/date column, enter the number of rooms to set aside for each room type. To soft block rooms, DO NOT enter information into the grid. It will populate automatically. Click "soft block rooms". Soft blocking allows you to set aside specific rooms rather than room types. The tape chart will open. On the tape chart's grid, click once in each square you wish to set aside for the group. To de-select the room, click again. Selected rooms will display yellow. When you finish soft blocking, click "Exit/Done" to return to the room block grid which will now be populated based on your soft blocks. From the Group Block grid, click "Exit/Done" to return to the Group Setup screen. Next, click the "Setup Event" button. If you have set up a Group, click the "Setup event" button on the Group setup screen. At the "Enter contract number" prompt, just press Enter to set up a new event. You will not see this prompt if you selected "Setup event" from the Group setup. To bring up an existing event, enter the contract number or click the Look-up button. The Event setup window will open. "Event Description:" Enter a description such as SMITH-JONES WEDDING, EXECU/TECH MEETING, WILLIAMS REUNION, etc. The event description may be up to thirty characters. This will print on auto-populated documents. When looking up an event, you will look up by description. "Customer Name:" This will be the name of the group such as SMITHJONES or EXECUTECH. If you set up the group first and then clicked "Setup event" this field will populate automatically. "Address 1:" If you set up the group first and then clicked "Setup event" this field will populate automatically. "Address 2:" If you set up the group first and then clicked "Setup event" this field will populate automatically. "City/State:" If you set up the group first and then clicked "Setup event" this field will populate automatically. "Postal code/Country" If you set up the group first and then clicked "Setup event" this field will populate automatically. "Phone number:" If you set up the group first and then clicked "Setup event" this field will populate automatically. "Fax/other:" If you set up the group first and then clicked "Setup event" this field will populate automatically. "Email:" If you set up the group first and then clicked "Setup event" this field will populate automatically. "Contact name:" Enter the name of the person to contact while the group is on site. If it is the same as the booking/billing contact, click "Copy". "Address 1:" Enter the address of the person to contact while the group is on site. If you clicked "Copy" this information will populate automatically from the booking/billing settings. "Address 2:" Enter the address of the person to contact while the group is on site. If you clicked "Copy" this information will populate automatically from the booking/billing settings. "City/State:" Enter the city and state of the person to contact while the group is on site. If you clicked "Copy" this information will populate automatically from the booking/billing settings. "Postal code/Country:" Enter the postal (ZIP) code and country of the person to contact while the group is on site. If you clicked "Copy" this information will populate automatically from the booking/billing settings. "Phone number:" Enter the phone number of the person to contact while the group is on site. If you clicked "Copy" this information will populate automatically from the booking/billing settings. "Fax/other:" Enter the fax or cell number of the person to contact while the group is on site. 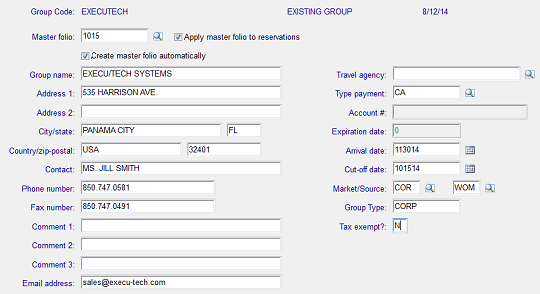 If you clicked "Copy" this information will populate automatically from the booking/billing settings. "Email:" Enter the email address of the person to contact while the group is on site. If you clicked "Copy" this information will populate automatically from the booking/billing settings. "Contract number:" The contract number will display after you save the event. "Event amount:" The event amount will display automatically after you have entered the event items. "Payments received:" The total payments will display automatically if payments have been posted into the master folio. "Deposit 1 amount required:", "Date:" Enter the dollar amount of the first deposit due. Enter the date that the first deposit is due. Click the calendar icon if you do not know the date. This information will print on the auto-generated documents. "Deposit 1 amount required:", "Date:" Enter the dollar amount of the second deposit due. Enter the date that the second deposit is due. Click the calendar icon if you do not know the date. This information will print on the auto-generated documents. "Deposit 1 amount required:", "Date:" Enter the dollar amount of the third deposit due. Enter the date that the third deposit is due. Click the calendar icon if you do not know the date. This information will print on the auto-generated documents. "Event date:" Enter the first date of the event. If you set up a group first, the date will populate with the arrival date entered for the group. "Contract due date:" Enter the date that the signed contract is due. This date can optionally print on the event contract or other generated documents. "Minimum revenue:" Enter the dollar amount of the minimum revenue required. "Event confirmed" Click "Event confirmed" when you would like the meeting rooms or venues to display as confirmed on the meeting room/venue availability screen. Next you are ready for additional tasks. To post deposits from the Event setup screen, click the "Post Deposit" button. The Post Folio (Post Charges/Payments) window will open. Enter a valid payment code in the Payment screen. If you are processing a credit card, a prompt will ask if you wish to process a credit card. You may enter a reference such as a check number. DO NOT enter anything in the Reference field if this is a credit card transaction. Enter the amount of the deposit. Note that payments are credits to the guest and therefore automatically will insert a minus sign (-). Press Enter at the OK? field if the information is correct. If your cursor returns to the "payment" field, press the escape button on your keyboard. You will return to the Event setup screen. Entering event items is the fun part. This is where you enter all of the items that should print on the Event Order or BEO. You can enter food & beverage, venues, media, setup, and anything else you wish, including non-chargeable items, as long as it has been set up in the event control records. The fields at the top of the screen will populate once you click "Calculate totals" after you've entered items. You should start in the Item column and use your Enter or Tab key to navigate from field to field, rather than use your mouse. That way you will make sure to save information entered into each field. When you are in the Post column, press Enter twice to save the line and return your cursor to the next line. The line will not be saved if you do not do this. If an item is required for more than one day we recommend entering it for each day required, so that it prints accurately on the BEO or other document. "Item" Enter the item code or type ? and press Enter to look up by category. To delete an item, type D. Note that if you delete an item after it has posted to the folio you will need to adjust it in the folio. "Description" The description entered into the item's setup will display. You may overwrite if you wish. "Comment" Optionally enter a comment. "Quantity" Enter the quantity of this item. "Unit Price" The default price entered into the item's setup will display. You may overwrite if you wish. "Extended Price" The system will calculate automatically the extended price based on quantity and unit price. "Date" Enter the date this item is required. If the item will be included on more than one day and you do not wish to enter it for each day, enter the first date required. We recommend entering the item for each date required for detailed Event Order accuracy. "Beg Time" Enter the beginning time for this item. Enter hour and minutes with no punctuation or spaces. Do not use military time. For PM type P. Example: 7:00 am would be entered 700 and 7:00 pm would be entered 700P and so on. "End Time" Enter the ending time for this item. Enter hour and minutes with no punctuation or spaces. Do not use military time. For PM type P. Example: 7:00 am would be entered 700 and 7:00 pm would be entered 700P and so on. "Post" Type Y if you wish this item to post to the master folio when "Post to folio" is selected. Type N for the item not to post. You may change it to Y at a later time. The field will automatically display X once the item has posted. After all of the items have been entered, click "Calculate totals" to display the breakdown by Food/beverage, Media/AV, Setup, and Other, Service charge, and Tax. These are defined within the item's setup in the control records with the exception of Tax. Tax is defined in the Hotel Charge Code and Tax Code setup. Click "Print screen" to send an image capture of this screen to the printer or to a PDF (if you have a default CutePDF printer). Click "Post to folio" to post items with Y in the "post" field or to post all items to the master folio. Calculated service charge and tax will post also. Click "Print check" to print an event check for signature or authorization. You may print by date or "all". Click "Delete items" ONLY if you wish to delete all of the items for the event. A prompt will display, in case you selected this by accident. To delete only one item, type D in the "item" field. If deleted items have already been posted to the folio, you will need to adjust them in the folio. Click "Save/exit" to save the information and return to the Event setup screen. 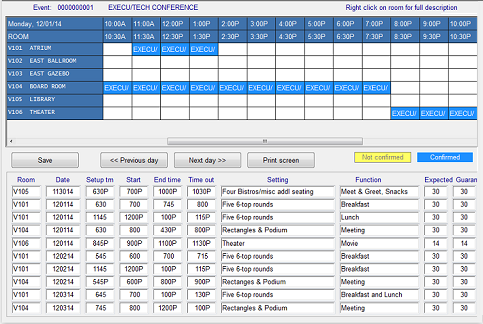 Click "Rooms" at the bottom of the event setup screen to book meeting rooms/venues. The new window will open to the starting event date. The event's first date will display. You may enter meeting rooms for all days on one screen. To view future dates for, you can click the "Next day" button. Rooms/venues and room types are set up in Hotel control files . The information can print on the event order, contracts, and other documents. "Room" Enter the room number from those listed in the blue ROOM section at the top of the grid. "Date" Enter the date in MMDDYY format. "Setting" Enter setup or other information. "Function" Enter the function such as wedding, meeting, reception, etc. "Expected" Enter the number of persons expected for this room at this time on this date. "Guaran" Enter the number of persons guaranteed for this room at this time on this date. This screen is for booking only. To add the items to the event order or contract or to include it in the event's charges, click "Enter Items" on the event setup screen. Click "Save" to save and exit this screen. You can type memos for each department. These memos can print on the event order, contracts, department memos, or other documents. Emailing of department memos is not available at this time but will be available in the next release which customers with a support agreement can receive at no additional charge. From the event setup screen, click "Memo" and then select the department from the list that pops up. 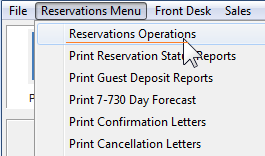 Each separate line is available to print on generated documents such as an event order. You can tag the documents to include all or some of the lines. Click "Print" to print the department memo from this screen. Here is an example of a memo sent to the printer. To type a brief timeline for the event, click "Timeline" on the event setup screen. Click "Generate documents" on the main event setup screen to populate default Microsoft Word® documents with the event's details. See "Getting Started " for instructions on creating document templates. A list of your document templates will display. Select the document you wish to generate. DO NOT select a document from an event folder (such as FIRST METHODIST MEETING) as those are already-generated documents. Even after the message closes there will be a slight delay, as the document is being populated with the event's information. Please wait. When the document generation is completed, the Word document will open. It may open in front of or behind your Execu/Tech screen, so look in your taskbar. 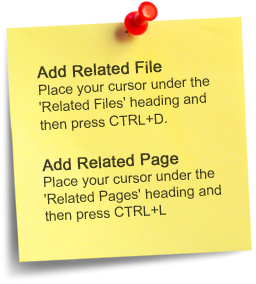 Once the document displays, you edit it, print it, save as a PDF, etc. Continue in like manner with each document. The event's generated document will be located inside the event's folder located within the Documents folder which will be in the ExecuTech Hotel folder on the server or wherever the Execu/Tech software was installed. You can create a shortcut on your computer desktop or inside your My Documents folder for convenience. The documents easily can be attached to emails. You may create additional reports to be used in Generate Documents by creating a template containing the tags you wish. Prior to the group's arrival you should have entered reservations for guest lodging accommodations. If you need to change anything for the reservations for the entire group, such as an added comment or a change of arrival date, you can do this in the Group setup screen and then by clicking "Update Reservations". You can check in each guest individually or you can check them all in at once as a group. To do a one-button group check-in, each reservation must have today's arrival date ("today" being the day you are checking in the group), a valid payment type in the Guarantee Code field, and a room number assigned. If guests are paying their own room and tax charges, or their own incidental charges, make sure to preauthorize the guests' credit cards if that is your policy. See Front Desk Operations for further instructions on checking in guests. At any time during the event you can print and present an Event Check for approval. You can select a specific date or print all items. After the event and after the guests have checked out, you need to post any final charges and payments to the master folio and then close the master folio. On your Execu/Suite home screen click the "Post Folio" icon or go to Front Desk Operations > Post Charges and Payments. When the Post Folio (Post Charges/Payments) screen opens, post any additional charges. DO NOT POST final payments at this time. You should do that through the check-out process. After all charges have been posted, go to Check Out. When the Check-Out screen opens, click "Close master folio". At the prompt, enter the master folio number. If there is a balance, the system will take you automatically to the Post Folio (Post Charges/Payments) screen. Once you post the final payment, the folio will close. If the payment is by credit card, make sure to follow proper credit card processing procedures. If the payment type for the master folio was DB, then the Direct Bill transaction will be created during night audit and can be viewed the following day in Direct Bill (City Ledger) under the customer name. You can print or send a statement if you wish.